In this episode: I talk about Hannah Fettig’s Featherweight Cardigan, name some Welsh mountains and discuss what they have to do with my socks. I spend a lot of time talking about this thing I do with beads that solves a top-down sweater-knitting “problem” that nobody else in the world thinks is a problem. And we go to Amroth Beach. And then, a month later, more or less, I come back and tell you how all the things I was going to do later actually went. The office is done, and I am back at my desk. So there’s that. I’ve also been cranking out Churchmouse Turkish Bed Socks like Christmas is coming. Seriously, I cannot stop knitting these things. I began writing letters, and getting some back. If you’d like to receive a letter from me, you can sign up for that here, or use the sign up form in the sidebar, just to the right. Yes. That one. Just there. The series of books I raved about begins with Rivers of London in the UK. The same book was published (for some unfathomable reason) in the US under the title, Midnight Riot. All the books in the rest of the series have same titles on both sides of the pond. Music by Baltic Sea Surfers, Lativian Surf;Heather Gruber, Facing the Ocean; and Ukulele Jim, Ocean Song. Since I live on the Great Plains, the beach description is a treat. Thank you. I think the beads on the end of waste yarn on a top down sweater is great idea. I will try it on the next top-down sweater. 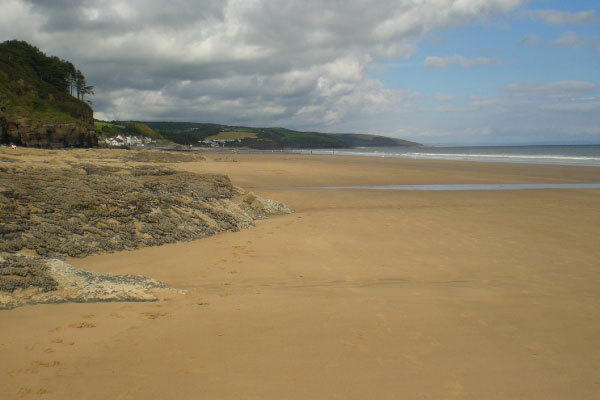 Loved your podcast today – Amroth Beach sounds wonderful I can understand how strange it must have been when the storms swept the sand away. The familiar suddenly becoming the unfamiliar for a while. Dogs and beaches – heaven. I hope your new space is just how you like it – speaking as someone who still has to use the dining table for everything. All my yarn, fabric etc is in plastic boxes stacked at the back of the house out of the way, consequently finding anything is a heroic challenge not to be taken lightly! Another great podcast! Thank you , Brenda for sharing YOUR beach… It’s truly lovely and serene. It reminds me of MY Florida beach of my youth. That beach has changed for ever, or for many years, and it makes me smile yours has recovered. Congratulations on your office , I look forward to pictures. Best Always! Hearing you talk about your beach makes me think about the beautiful places I consider “mine.” I have a pond (at my family camp), but it requires a drive of a couple of hours to get there. I have a park that I often stop at during lunchtime to visit the ducks, but that doesn’t quite feel like “mine” because of all the other people there. I think I need to find my nearby place. For the record I think your beads idea is very clever. I usually use a rough yarn as the waste so it doesn’t slide around, and don’t bother to tie the ends. But the beads let you set the spacing and leave it which is perfect. Listening to this podcast brought back memories of our trip to Wales in ’98, just before our first daughter fledged for marriage and a long move away from us. We drove along lots of the coastal areas, but sadly headed north west out of Swansea and missed YOUR beach. Oh, how I wish I had know about it back then. What I learned about that visit to Wales most was, I want to go back again!!! Okay, haven’t listened to the whole thing yet, but I just had to pause the podcast to come over here and say the bead idea is BA-RILLIANT! I’m working on a Featherweight right now, and will apply this technique today. I’m almost halfway through the project and my interest was starting to wane (wool + July, you know how that goes) but now I’m so excited again! Thank you! I’m sorry, my comprehension skills left me down and I didn’t catch the title and author of your Audible recommendation. It sounds so intriguing. Missed you, knit-twin! I hope you had a wonderful birthday. I knit the Featherweight for someone last April. It was fast, and just interesting enough. Every time you get bored, there is a change in direction. 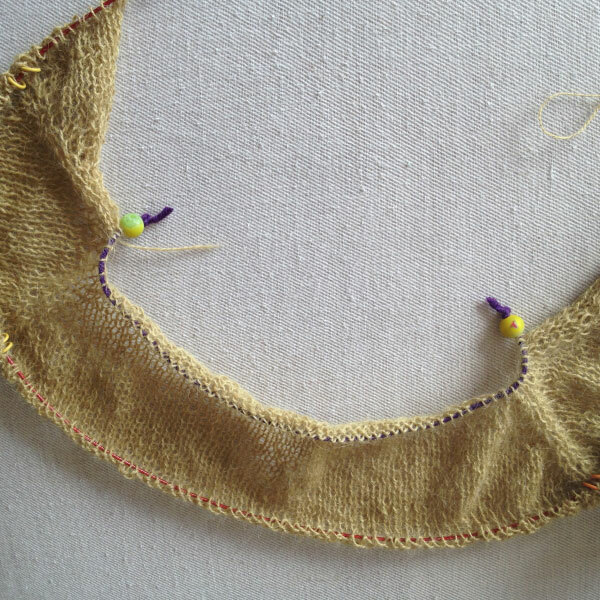 I can’t post a photo here, but it is on my Ravelry page (wynjeanne), and is called Martha’s Sweater. I added an Ikea shelving unit to my office. Now all the craft books are together. But not all of the yarn. I really need to winnow the stash…. I’m a bit behind in listening to my podcasts, so am enjoying hearing your voice again. As a transplanted Oregonian to the desert (Mesa, Arizona), the sounds of the ocean were so soothing. (The beach, sitting in the dunes or walking along side the waves is my “place” of calming.) I didn’t get up to Oregon this year, so this provided a bit of “home” for me during this long, hot summer! Thanks for the wonderful podcasts and sharing with us all these years! Brenda, just wanted to say that I finally listened to the last 5 or so episodes recently and picked up Rivers of London/Midnight Riot last week and am LOVING IT. I’m in Toronto, so the book has this weird thing of having the N. American title Midnight Riot but the UK cover (with the map of London). One of those things about living in a commonwealth country, I think. Anyway, just wanted to send along a note to say thanks for the recommendation!